Porsche restocked them about 6 months ago like they seem to be doing with most 928 parts. Once they have them made again the price always escalates significantly. Last time I checked they had plenty in stock - problem is the price!!! Roger what's the price on the Porsche part? List is $185 - I do not think that is too bad for a part that will be good for 25 years. Followng that link a day later finds a list of coolant TEMPERATURE sensors, goes to other sensors like oxy and brake pad wear sensors. No levelsesrs. Am I missing something? Hmm..I just clicked on the link I initially posted and it went right to the coolant level sensor just as its supposed to. I guess try it again? This is what comes up for me. 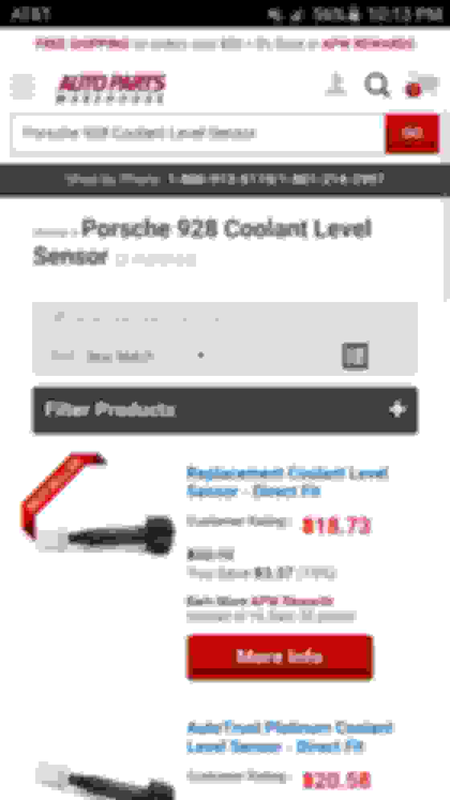 The headline says "Coolant Level Sensor". 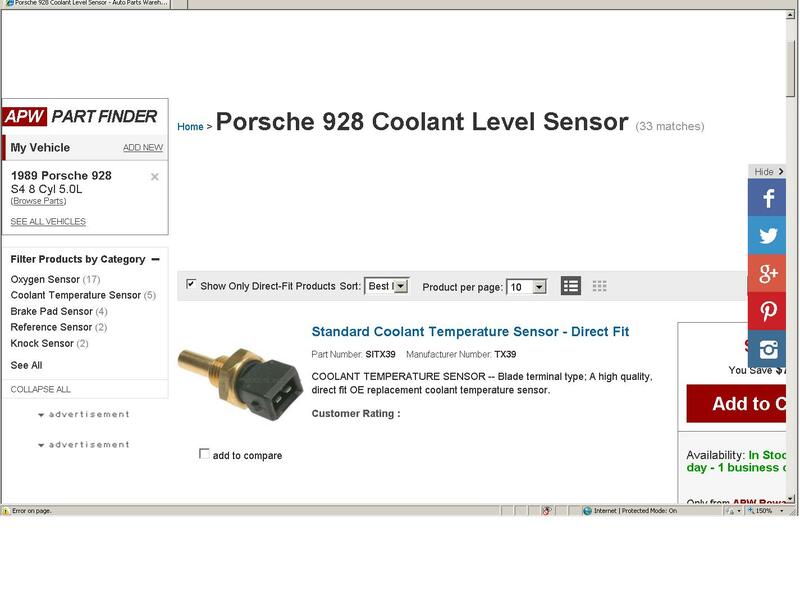 The items are not coolant level sensors. That's so strange! This is what i get. I got the same page as MJ. At $20 a pop well worth a shot to nothing I reckon. Not sure I agree with Roger on the stock item being "reasonable" at $185 a pop - outrageous is a word that more easily springs to mind in this instance. Note that the top cap is the wrong color on these replacements. Yes sir, we pointed that out in the beginning of the thred, Roger suggested we may be able to swap the cap out. Related tangent, but I presume the coolant overflow tank must be out of the car to remove the sensor? I replaced my overflow tank last weekend while the engine was out and could not see an angle to get the sensor in with the tank in place (unless maybe you remove the fender). Great to hear!...Tracking shows mine should arrive tomorrow. Happy to see it works fine. Might order one as I'll change my coolant tank soon. Last edited by Bertrand Daoust; 04-02-2016 at 06:13 PM.